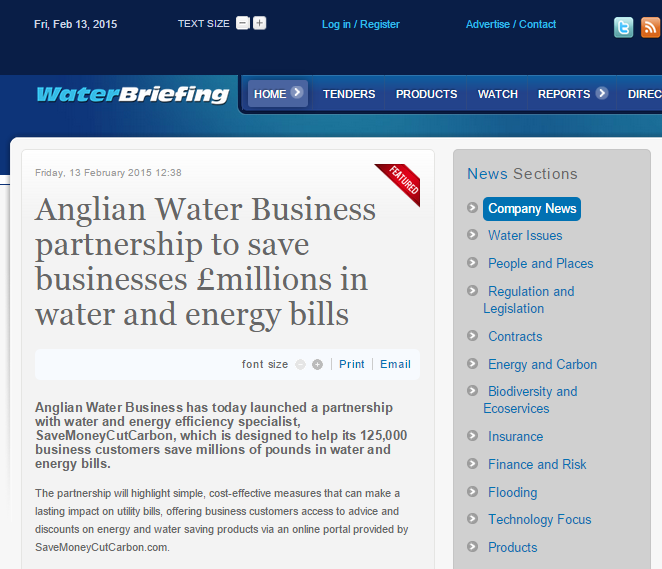 Top water industry portal Water Briefing highlights news on the Anglian Water Business partnership with SaveMoneyCutCarbon to deliver £millions of savings to its business customers. The partnership will highlight simple, cost-effective measures that can make a lasting impact on utility bills, offering business customers access to advice and discounts on energy and water saving products via an online portal provided by SaveMoneyCutCarbon.com. The campaign will be promoted in water bills, bulletins and on the Anglian Water Business website. The partnership will further strengthen Anglian Water Business’s position in the deregulated water marketplace which opens for business customers in 2017.